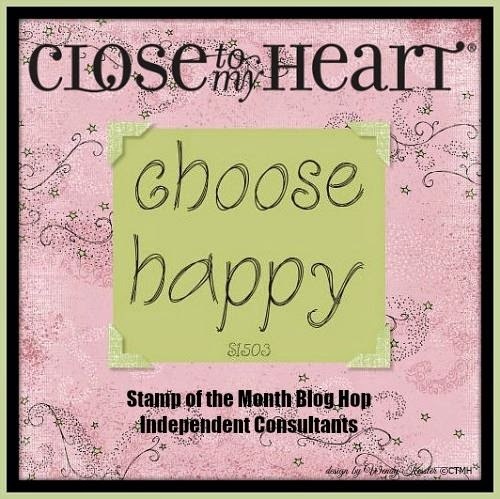 This month we are highlighting the March Stamp of the Month, Choose Happy. It has some beautiful frames, cute sayings, and a fun border and it can be yours for just $5 with a qualifying purchase! If you are coming from Melinda's Blog, you are on the right track. You can find a complete listing of participants at Adeline's Blog, should you get lost along the way. 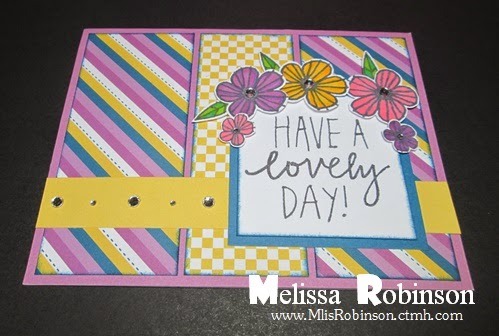 I used a pattern from the Make It From Your Heart Volume 1 book to create my card. I wanted something simple that would not detract from the beautiful frame. 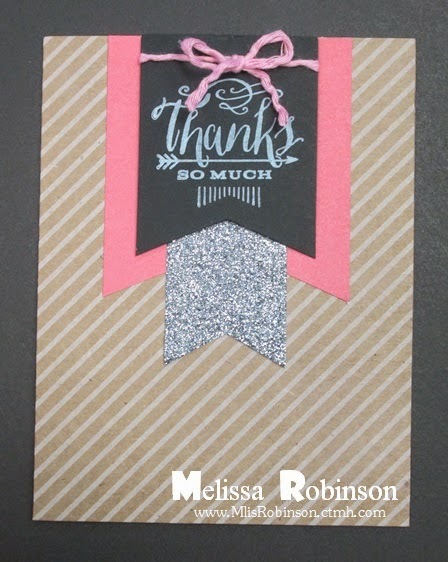 I stamped it in black ink and used the ShinHan colors to make it coordinate with the Zip Strip (the chevron piece of paper) that came from the Brushed paper packet. The Gold Shimmer Trim just added a little sparkle as did the Clear Sparkles. 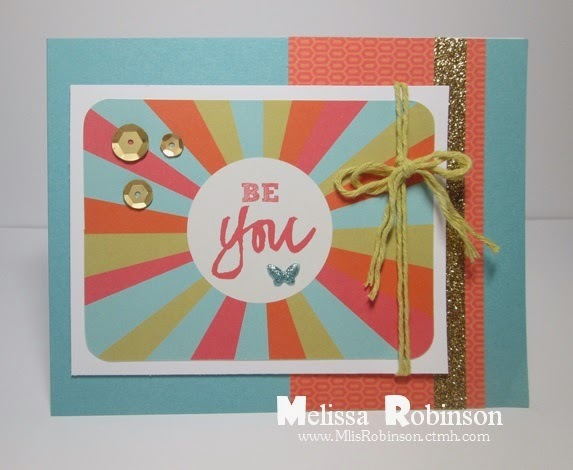 This is the exclusive stamp set used for the background, stamped tone on tone to the Pixie cardstock with Pixie ink. 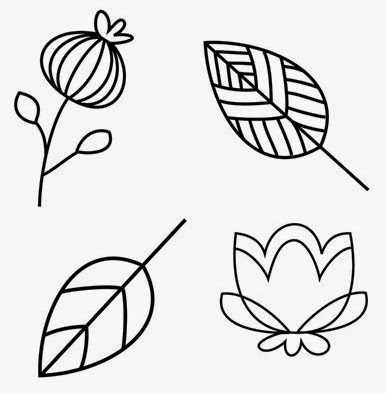 Hop on over to Sheila's Blog and see what fun creation she has in store for you. Yeah...so you can tell I have moved past the winter colors real fast and am ready for Spring! LOL Unfortunately, or fortunately (as long as I can stay inside to enjoy the snow and ice), the weather is not aligning with me! Oh well...these kind of cold weather days give me a good excuse to stay inside and papercraft! That is what I plan on doing this weekend! 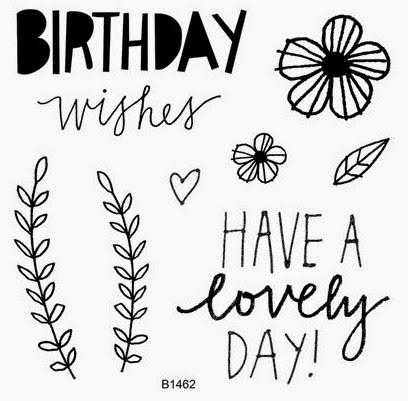 I used the Confetti Wishes paper packet - the colors are just fun and cheery - and this stamp, "Lovely Birthday", to create this card. I used a pattern from the Make It From Your Heart How-to Program for the design. The flowers and leaves were colored with the ShinHan markers and 3-D on the front of the card. Some clear sparkles added the perfect finishing touch to the card. 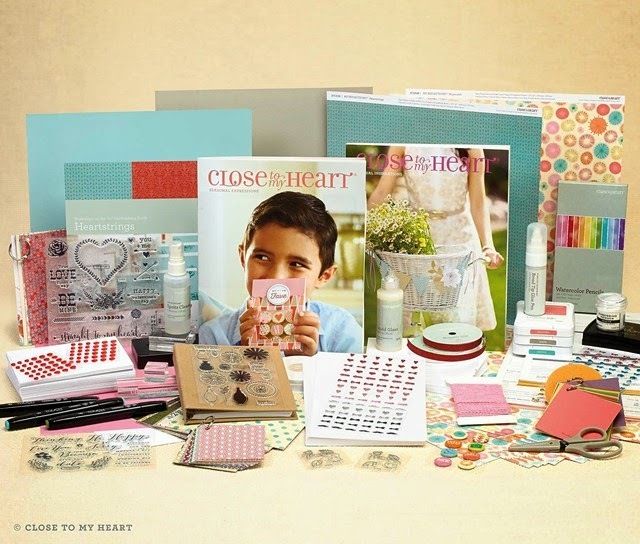 I seldom come up with any card or scrapbook designs from scratch so am thankful there are various resources from which to be inspired. 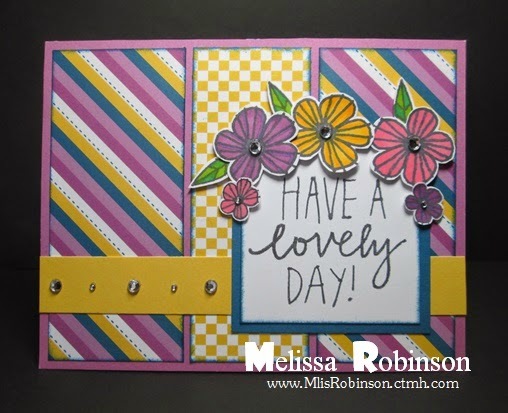 Today I used this sketch from CASE(S) this Sketch #111 to create my card. I used our Dot Embossing Folder, on Hollyhock cardstock, and then distressed it to expose some of the white core. I layered it onto a slightly larger piece of White Daisy cardstock to allow for the border, needing to set it off a bit from the patterned B&T. This stamp set, "Everything is Better with a Friend" is only available through March 31, 2015 and is only exclusive to hostesses. You can get it by hosting a physical or online Gathering or by placing a $150 order. (Contact me with questions.) It is definitely one of my favorites! If you are "off" today because of cold weather in your area, it is a great excuse to get out your papercrafting products! :) Have a blessed day! As posted yesterday, there is a fabulous recruiting offer that will take place during March. I have been a Close To My Heart Consultant for over 16 years and still love it as much (and maybe more) than I did then. 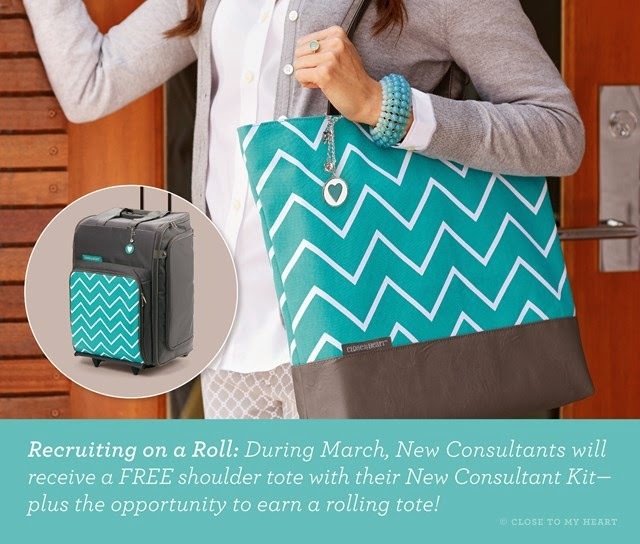 There are so many great things to love about this company as a Consultant, including the fabulous products, getting a discount on your purchases, and being the first to know about the newest product releases and campaigns. But more importantly, I LOVE the many people I have met over the years who have helped make this a fun journey! I am finishing up a team retreat this weekend. We get together various times throughout the year be it at trainings, retreats or conventions. There is always sure to be fun and creativity whenever we get together. It is one of the things I live for. Debi won Left Center Right, collecting on some fun paper! Terry winning Left Center Right Game. 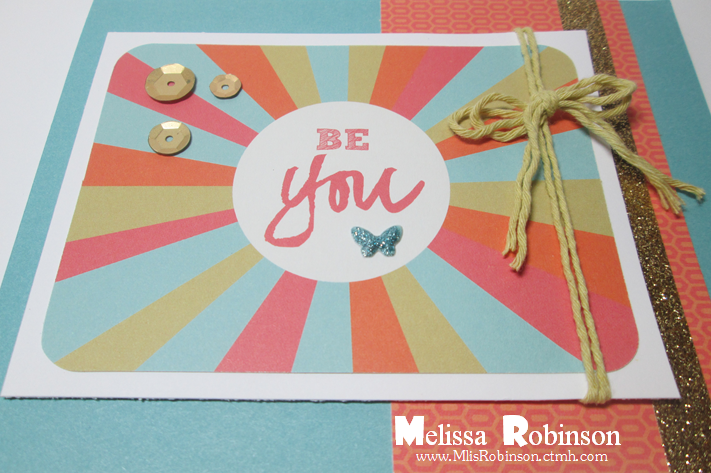 Check out all the fun embellishments! Having lived far away from my upline's, I am sure to include my long distance team members in our fun events - even from afar. If you have any questions about joining this fun journey, let me know! You will love the fun! This may seem too good to be true but it is totally real and has never happened before (and may never happen again)! 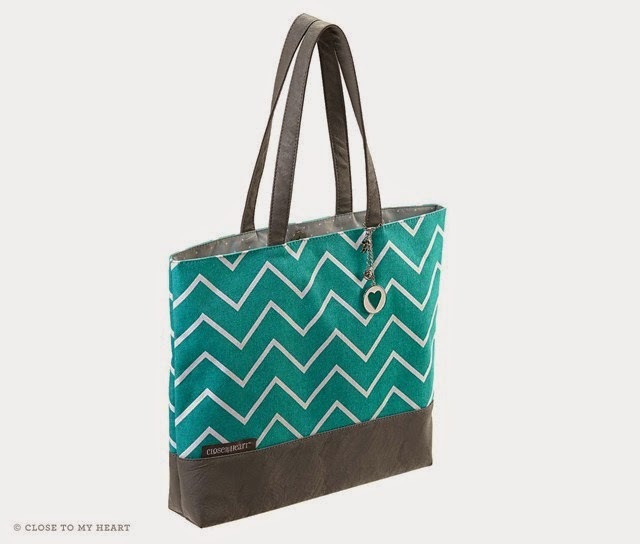 ;) If you join my team and Close To My Heart in March, for just $99 (plus shipping and tax), you will get this gorgeous chevron tote for FREE! (It is selling for $26.95) Yep! It's true - totally FREE just for joining the CTMH fun! There are no strings attached. BUT...be sure to read all the way to the end of this post because believe it or not, it does get even better!!!!! Here is another view of this shoulder tote. I own one. I love it. :) It's spacious, stylish and does hold 12 x 12 paper. Click here for complete details. 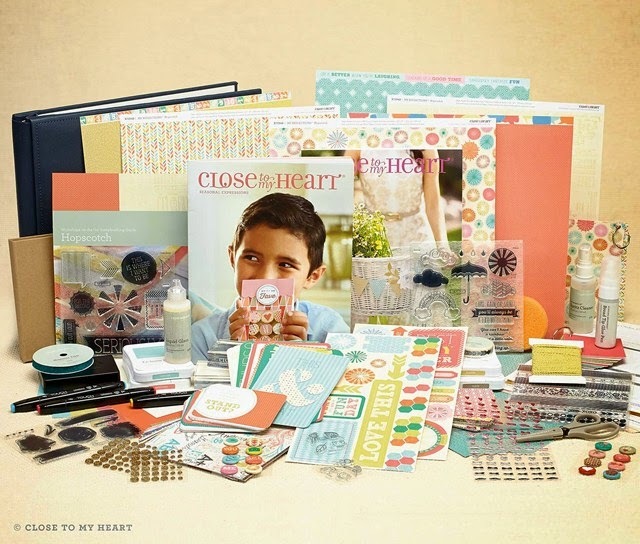 These photos are snapshots of the SAMPLE Consultant Kits you get to choose from when you sign up. I say SAMPLE because come March 1st, the NEW kit will be released and contain BRAND NEW product that we have not seen before! One of them has a scrapbooking focus and other, cardmaking. Both are a fabulous offer with over $370 in value - for just $99! 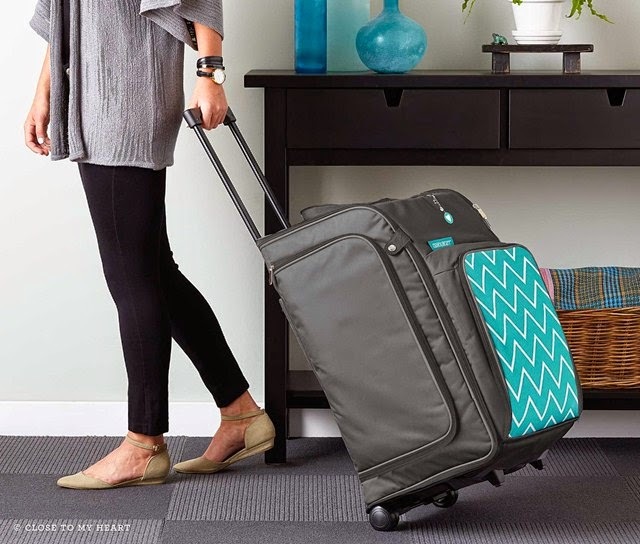 Details: Remit $300 worth of commissionable sales in your first 40 days after your New Consultant Kit ships and you will receive the rolling tote as a FREE bonus (not including shipping/handling)! Beyond that, no strings attached! So check this out... Are you ready for this?! That is $545+ CTMH product for just $99! If anything ever sounded too good to be true this is it but it's completely true! YOU ARE NOT DREAMING! This offer is only available March 1-31, 2015. I will share benefits of joining my team in tomorrow's post which includes joining all the team fun. We are having a team retreat this weekend and you would be invited to join us at all future events. We are never too short of fun! Please contact me if you have any questions or are considering this fabulous opportunity. I would totally love to have you and am just short of my recruiting goal! Enjoy this fabulous Saturday wherever you are! 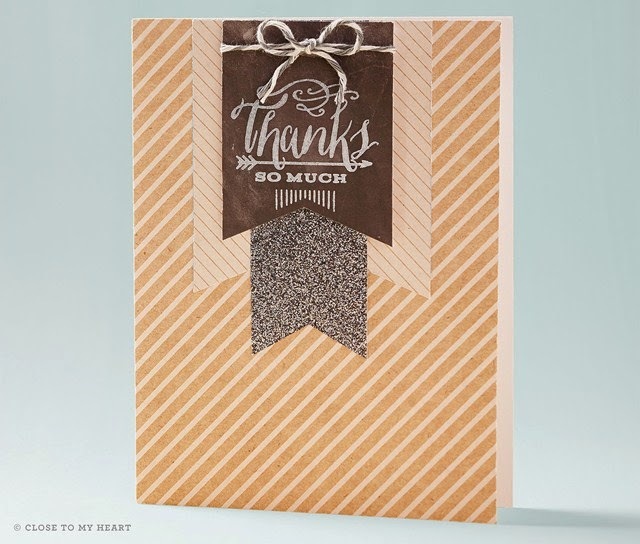 The Cut Above Thank You Card kit, designed to create cards that look like these, come pre-cut and ready for assembly. How awesome is that?! You get 10 card kits for just $10.95. 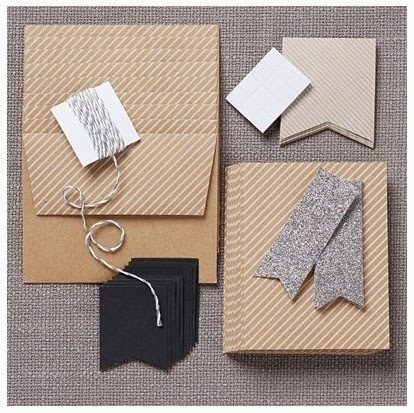 These are how the pieces come in the kit with you adhering them with your choice of adhesive, adding dimension with the foam squares, and cutting twine to tie on the sentiment. I used our White Daisy Exclusive Ink Pad to stamp the sentiment and made sure to allow it ample time to dry before assembling the card. 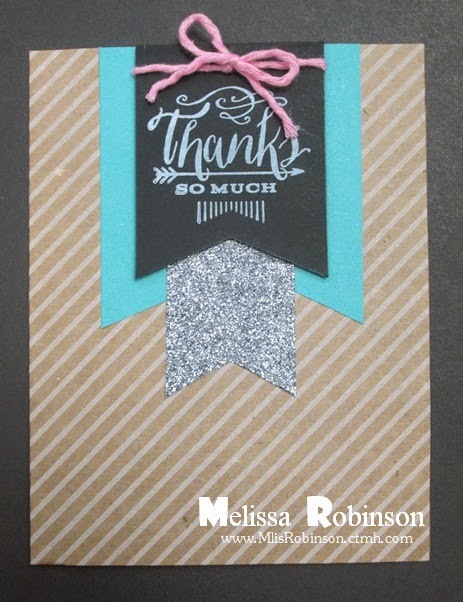 To add some color, I decided to incorporate Lagoon and Smoothie cardstock, and some Pixie Twine for a twist. Do you like it? 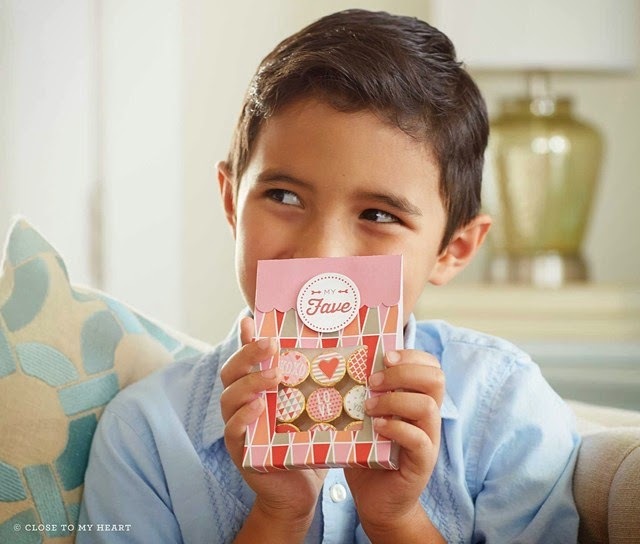 I totally love these card kits; perfect for quick assembly, with an added twist. If you are coming from Michelle's Blog, you are on the right track. 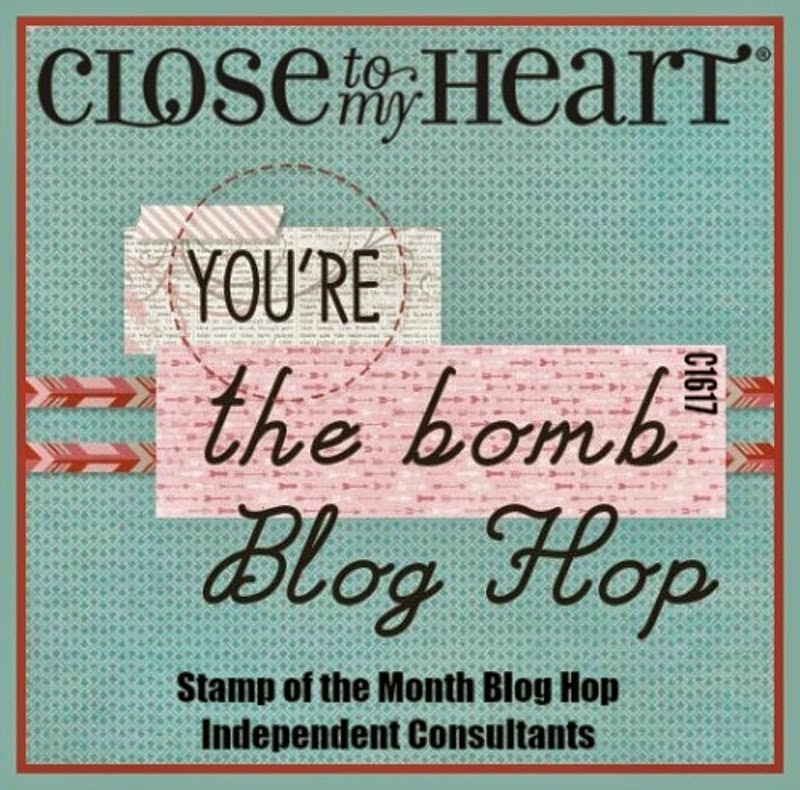 There are 15 of us participating in this hop and you can find a complete list of participants by visiting Sheila's Blog. 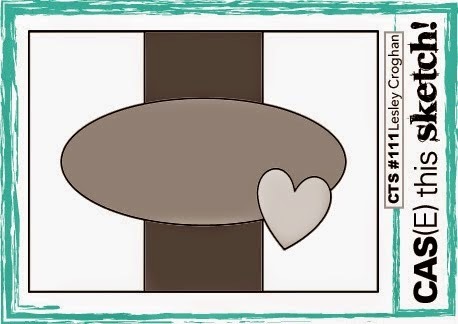 Thank you for joining us this month as we highlight a technique, which is both simple and fun, that jazzes up your artwork creations with the little help of a Journaling Pen. I love to use a journaling pen to add a little "extra" to my projects when it needs just a bit more. This is how the technique reads as found on page 34 in our Annual Inspirations Idea Book: "Jazz up your pages with a journaling pen and your creative hand! Outline individual letters and other accents with the pen to better contrast them with the background, making them bolder and easier to read." On this card, made with two Hopscotch Picture My Life cards, I used the journaling pen to doodle around two pieces of paper (one B&T and the other cardstock) and around the small sentiment. 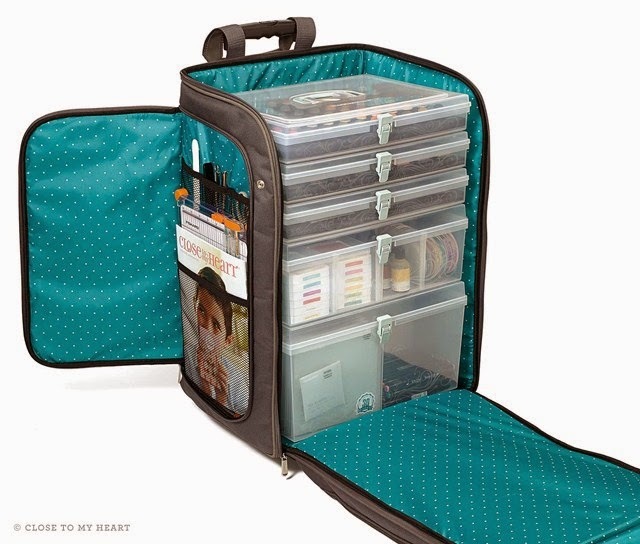 Now, head on over to Debi's Blog where you are sure to find something ingenious and fun! We are highlighting some of the fabulous products that were released in December and included in the Seasonal Expressions supplement. If you are coming from Hilary's Blog you are on the right track. There are nine of us sharing our artwork so I hope you enjoy what you see! I decided to incorporate a Hopscotch Picture My Life Card for the focal point on this handmade card. For right now, this Picture My Life card set is my favorite. I love the fun colors! I layered the 3" x 4" card onto some White Daisy cardstock, deciding I did not want to corner round the corners and then made it 3-D with our THIN 3-D Foam Tape (yeah...another new-found love)! I used our Gold Sequins, Gold Shimmer Trim, a Junebug Puffie (soon to retire), and some Flaxen Extra Thick Twine (also soon to retire). I separated the twine to have the doubling on the bow. While this card was super fun and easy to make, I hope the recipient (whoever that may be...) loves it! Feel free to leave a comment and then head on over to Wendy's Blog. Here is a list of the items that will be retiring March 31st. Be sure to check them out before you can no longer order them! Have a blessed week and happy hoppin'! If you are coming from Michele's Blog, you are on the right track. There are 20 Consultants showcasing this stamp set. I am the start of the hop. A complete list of participants is located at the end of my post. I created two cards for this month's hop - just could not get enough of it. A few Silver Sequins and Thistle Diagonal Stripped Ribbon and I was finished! 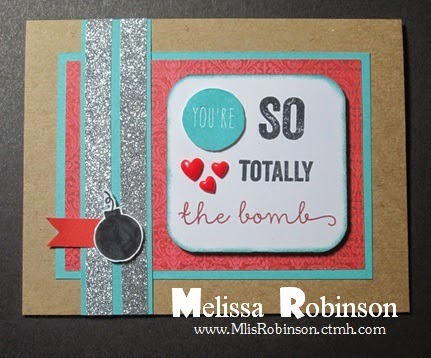 For this card I used Kraft Cardstock, the Heartstrings paper packet, Lagoon cardstock, and coordinating inks. I kept it pretty simple by adding two strips of Silver Shimmer Trim and Red Enamel Hearts. This stamp set really is too fun! Thank you for stopping by! 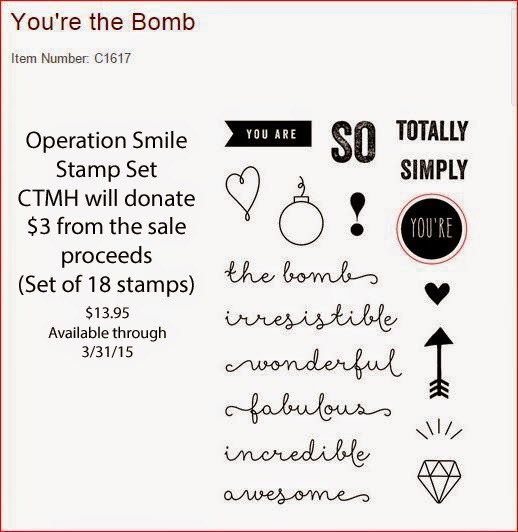 I hope you have fallen in love with this stamp set! 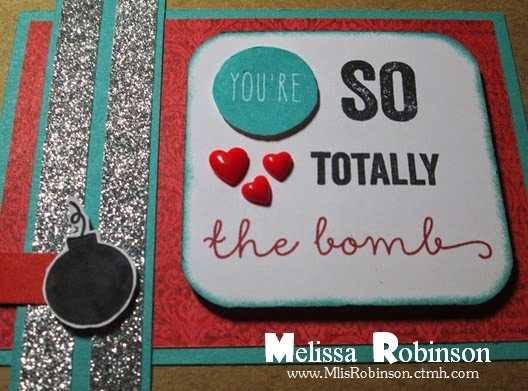 Now head on over to Melinda's Blog. She always has something fun! BOGO on our Albums in February!